There aren’t a large number of options in the Yamaha APX series of guitars. But when you have one of the best selling acoustic-electric guitars in the line-up, there isn’t much need for variety – or perhaps this is what Yamaha is thinking. This overview will cover the 6 models now in this series. These models are still available in some places. O.K. Let’s get started and take a look at each guitar individually. 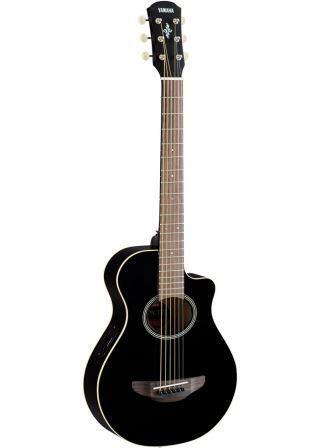 This is claimed to be the best selling acoustic-electric guitar worldwide. So they must be doing something right if that’s an accurate statement. There are a couple of unique features with this guitar. The first is the shallow depth of the body of the guitar (3 9/16″ at the deepest point). This is significantly shallower than a lot of acoustic guitars. This can make it nice to play – particularly standing up when performing. The sound won’t be as loud as a larger bodied guitar – but this guitar actually packs a punch for the size -more than I expected. And since this guitar is designed to be plugged in, you won’t notice it if you play it plugged in most of the time. The other thing is the oval soundhole – where most guitars have a circular soundhole. According to Yamaha this increases lower-mid response and gives a more open low end characteristic. The electronics on this model and the other models features an under saddle piezo pickup, 3 band equalizer, frequency control and a chromatic tuner. As you might have guessed, this is the left-handed version of the APX700II. Apart from that it is identical to the APX700II. You might have guessed this one too! Yes, it’s the 12 string version of the APX700II. There are a couple of other differences that this brings. This is the ¾ version of the APX500III. The main difference between this and the APX500 is the size. With just a 2 7/8” (75mm) body depth at the widest point, a body length of only 15 ¼”, a lower bout width of just 11 ¾” and a reduced scale length to (580mm), this a seriously small guitar. A great option for anyone looking for a guitar for a child or to use as a travel guitar. Thanks for reading and I hope this has given you a quick overview of Yamaha’s APX series and the different guitars offered within the series. Hi< I have an APX-5-CBS I bought new in 2000, I can't find any info on the CBS model, do you know?